All posts tagged with "Our first challenge is to create an entire economic infrastructure from top to bottom out of planks"
On the resource end of things, Clockwork Empires is largely a game about production – What resources can you get? How many? How quickly? Progression through the game is largely governed by a flat rate of what modules you can afford to build. Our module design, however, centers around an increasing economy of scale – this calls for the player to be using commodities constantly, not merely when they want to build something new. 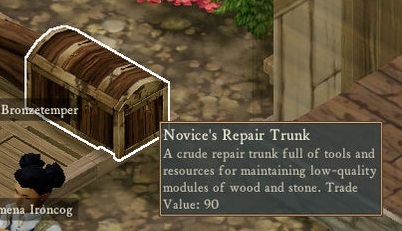 A long while back, as a sort of nod to this philosophy we implemented a repair system where modules break after a certain amount of uses and must be repaired. This wasn’t ever made a focus, however – it had no real dedicated UI and what items were necessary to repair modules was not explained. However, as economy balance begins to come more into focus we decided it was time to revisit the repair/breakage system. So, coming in the next experimental: Upkeep!